Manufactured in high quality UPVC, the Corovent CDV Continuous Dry Verge protects the verge from UV making it extremely resistant to light degradation and atmospheric pollution. The Continuous Dry Verge should be cut to the required length, allowing for a plumb cut at the ridge, and approximately 150mm longer than the rafter. The horizontal flange is cut away, to allow fitting over the felt support tray at the eaves. The battens are placed against the lip of the water channel of the dry verge, which are then nailed into position directly through the horizontal fin of the verge. The nails are fixed through both batten and verge, into the timber rafter. A close-up of the roof battens in place show their position against the lip of the drainage channel. Once all the battens are fixed in place, and the Dry Verge secure, the roof is ready for tiling. The roof tiles are fitted in the usual manner, ensuring that the verge tiles are fully inserted into the verge, where the top flange will hold them firmly in place. At the eaves, the verge should be cut square, flush to the lower tile, and notched into the gutter. 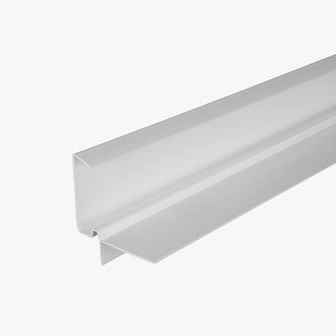 Eaves stop ends are available for closing the eaves on the 'R' and 'D' profiles. The water channel allows any rainwater to run directly into the rainwater gutter. The fitted Continuous Dry Verge achieves a professional finish. This will be similar for any roof tile or slate being used. The completed roof gives complete continuous cover against water penetration, and added strength from wind damage by securing end tiles firmly.